To Cite: Najafi N, Movahed K, Barzegar Z, Samani S. Environmental Factors Affecting Students’ Stress in the Educational Environment: A Case Study of Shiraz Schools, Int J School Health. 2018 ; 5(2):e67153. doi: 10.5812/intjsh.67153. Background: Environmental variables are one of the main factors affecting stress. This research aimed to determine environmental factors affecting students’ stress in the educational environment in Shiraz, Iran, in the framework of survey research. Methods: The study included a sample of 246 female high school students who were selected by multi-stage cluster sampling from a Shiraz-based educational district. As a tool for collecting data, a questionnaire was prepared by reviewing the relevant literature and in accordance with the research objectives. Cronbach’s alpha coefficient was calculated to determine the reliability of the questionnaire, which was equal to 0.72, showing a good reliability. The content validity of the questionnaire was also verified by experts and faculty related to the subject. In order to investigate the construct validity, after examining the internal consistency of the questions, the questionnaire was analyzed using the main components method. Based on the results of factor analysis, four factors including thermal comfort, physical factors, environmental interventions, and security were extracted. Data analysis was done by SPSS 21. The effect of environmental factors on student stress was investigated using one-sample T-test for each of the factors. In addition, Friedman test was used to study the importance of the environmental factors referring to each other. Results: From the viewpoint of students, thermal comfort (P value < 0.001), physical factors (P value < 0.001), security (P value < 0.001), and environmental interveners (P value < 0.001) comprised more than 60% of the factors affecting students’ stress in the classroom. In addition, average rating (AR) of the environmental variable was as follows: environmental interveners (AR = 3.31), thermal comfort (AR = 2.62), physical factors (AR = 2.50), and security (AR = 1.57). Conclusions: Environmental factors such as environmental interveners, thermal comfort, physical factors, and security could affect female high school student’s stress expressed in the order of importance. They should be taken into consideration by designers of educational spaces. Stress has been called the “health epidemic of the 21st century” by the world health organization (1). Stress is caused when requirements of a position are more than individual’s ability to cope with them (2). Some people think that children’s world is full of games and free of any pressure and tension. However, children might also feel mental and emotional pressure due to different stressors (3). Studies showed that psychological and physical signs of stress are common among school-aged children (4). As the prevalence of stress is in the world, Iranian students also suffer from stress (5). Different factors can cause stress. These factors may be individual or environmental. Environmental stress can be defined as the cognitive, emotional, and behavioral responses to an environmental stimulus or stressor (2). Four types of environmental stressors including cataclysmic events, stressful life events, daily hassles, and ambient stressors are distinguished by Evans and Cohen (1987). Cataclysmic events include infrequent events such as natural disasters that have a major impact on people and their environment and tend to affect larger groups of people. Stressful life events like family problems or illness denote personal events that people may experience on a daily basis. Daily hassles denote the things that we experience every day, like crowding and stressful commutes. Ambient stressors such as air pollution or noise are also referred to as background stressors (6). Ambient stressors are described as chronic, non-urgent, and negatively valued environmental stressors that are perceptible but may go unnoticed (7). Environmental stress can play an important role in the design of our environment (8). Major ambient environmental stressors are light (9-14), color (15, 16), noise (17-21), and temperature (22, 23). The main social environmental stressors are physical privacy (8, 24), personal space (20, 25-27), crowding (20, 28, 29), territoriality (2), and other factors like green space (30, 31). There is a growing awareness in contemporary societies about the impacts of exposure to environmental stressors on human health and quality of life. However, the vast majority of the previous research in human exposure to environmental stressors has focused on populations in urban areas. The lack of seeking environmental stressors in the educational environment could be seen in the research. It is important because stress may affect the students learning, health, and achievement (4). This paper directs the attention towards female students studying in high school, which has been less discussed by researchers. This study seeks to identify environmental stressors in the educational buildings among female students. The present study was designed to determine environmental factors affecting students’ stress in the educational environment in Shiraz, Iran, in the framework of survey research. The statistical population of the study included all 15 to 17-year-old female students in Shiraz, Iran. The sample size was 246 students, calculated by Cochran formula. The sample was selected by multi-stage cluster sampling from high schools of Shiraz. Regarding the educational districts of Shiraz, in the first stage, a district was selected randomly from the four districts. Then, four schools were randomly selected from the schools in the area. The research method used in this study was a survey method. The research was generally done in three phases. In the first phase, by using the review of the sources and using the views of the professors and researchers in the field of environmental psychology, environmental factors influencing stress in the educational environment were obtained. A researcher-made questionnaire was designed based on these factors. The questionnaire had a good validity and reliability. In the second phase, the questionnaire was distributed among students with their own personal satisfaction to determine the impact of environmental factors affecting stress among high school female students. In the third phase, the data were analyzed using SPSS 21. One-sample T-test was used to obtain the impact rate of environmental factors on students’ stress in the classroom and Friedman test was used to determine the importance of environmental factors. To investigate the environmental factors affecting students’ stress in the educational environment, a researcher-made questionnaire was used. The questionnaire consisted of 20 items that were measured using a five-point Likert scale. The reliability of the tool was evaluated using Cronbach’s alpha, and the value of 0.721 was found to be indicative of internal consistency. If the Cronbach’s alpha coefficient is 0.7 or higher, the questionnaire has a satisfactory reliability and we can be sure of the internal correlation of the questions. After determining the research questions and hypotheses, a questionnaire prepared by the researchers was used to collect information. In order to ensure its validity, the questionnaire was presented by the professors of the field of psychology and distributed to the sample after their confirmation. After analyzing the internal consistency of the questions, the questionnaire was factor analyzed using the main components method. Based on the findings of the factor analysis, the KMO value was 0.645, which indicated the sample size is suitable for the factor analysis, and the Bartlett value was 241.728, which indicated the suitability of the correlation of the entered variables for the factor analysis. 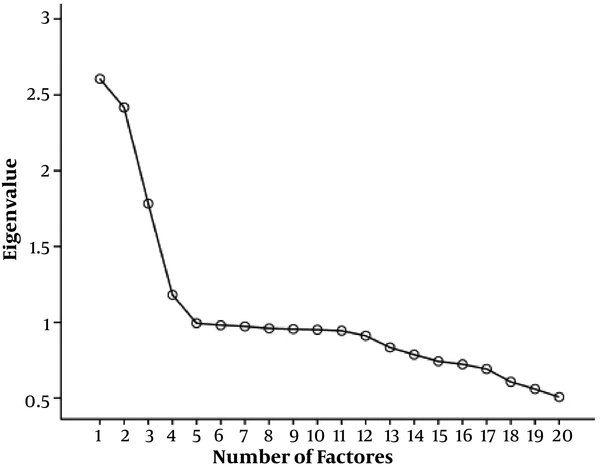 Following the factor analysis, four factors were extracted. The four factors were able to explain 63% of the total variance. The first factor with a specific value of 2.606 explained more than 20% of the total variance (Table 1). The positioning of the variables in the factors was assumed with the assumption of variables with factor load greater than 0.5, following the rotation of the factors by the varimax method. The eigenvalue decreased rapidly with the extraction of factors after the fourth factor. The first to fourth factors eigenvalues were greater than one; therefore, they remained in the output (Figure 1). Factor loadings are presented in Table 2. Based on the results of factor analysis, four factors were extracted. After determining the factors, we what studied the main variables assigned to each of the factors. In this stage, it was expected that some of the variables would be assigned to one of the other factors and another to another. The preliminary extraction of the factors did not determine which variable belonged to, which is why we entered the factor rotation for the interpretation of the factors. The quadruple factors extracted were largely in line with the design questions and the explanatory variables for the research model. Considering the factors that make up the factors, each factor, naming, and four environmental factors affecting students’ stress in the educational environment were obtained (Table 3). A total of 246 female high school students participated in this study. 39% of the students were in the 9th grade, 36% of them were in the 10th grade, and 25% were in the 11th grade. The mean age of the students was 16.4 ± 1.47. To test the first hypothesis based on the effect of environmental factors (thermal comfort, physical factors, security, and environmental interventions) on students’ stress in the classroom, one sample T-test was used. According to the four factors extracted, the test was performed for each of the factors (Table 4). In addition, the test values for environmental factors affecting students’ stress in the class were analyzed (P < 0.001); therefore, thermal comfort factors, physical factors, security, and environmental interventions were effective in the stress management of students in the educational environment and it can be said that in these factors, the average of sample is larger than the average of the society. a95% confidence interval for averages difference. Friedman test was used to investigate the second hypothesis of the research, i.e. the importance of environmental factors including thermal comfort, physical factors, security, and environmental interveners. In Table 5, the average, standard deviation, and average rating of the factors are observable. Chi-square statistic with 3 degrees of freedom was equal to 246.227 that, given the significance level (P < 0.001), the zero assumption can be rejected at the level of 0.001. Therefore, it can be concluded that the average of environmental factors is different and based on the viewpoint of the students, the environmental intermediary is the most important factor, and security is the least important factor affecting students’ stress in the classroom. According to the average rank, the factors can be identified from the most important to the least important problem, as follows: Environmental interveners, thermal comfort, physical factors, and security (Figure 2). It is important to identify environmental factors affecting students’ stress in the educational building. In today’s society, students spend as much time at school as they do at other places such as home. The objectives of this study were to identify the environmental stressor among female students in Shiraz. 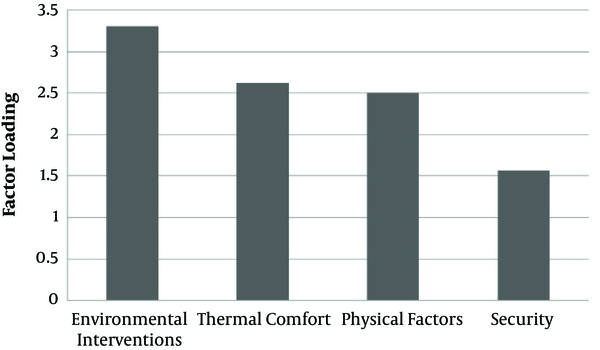 The results of this study showed that thermal comfort factors, physical factors, security, and environmental interventions were effective in the stress of students in the educational environment. In this study, thermal comfort factors included air temperature, humidity, wind speed, and student’s clothes and physical activity was 3.27 on average. These findings are in line with Epstein and Moran (2006) (32) research that investigated thermal comfort and heat stress indices. It follows the heat balance equation in which ambient temperature per se is seldom the cause of heat stress. According to Fanger, the interactions of six fundamental factors define the human thermal environment. Ambient temperature, humidity and air movement, metabolic rate, and clothing are variables that affect human response to thermal environment (33). Thus, any consideration of thermal stress should explore these six factors (32). According to the results of the study, physical factors such as space geometry, building age, space color, green space, and space materials are another group of stressors in the educational environment with an average of 3.24. As AL-Ayash et al. (2016) have proven in their study, there is a relationship between space color and stress (15). The impact of green space factor is in line with Ekkel and Vries (2016) study (34). Visual contact with green space can have a positive effect on stress reduction, even through a window (34). Moreover, Arnberger and Eder (2015) (35), Berto (2014) (30), and Li and Sullivan (2016) (31) described green space as a stress-reducing factor that is in line with the results of this study. Space readability, privacy, space standards, crowd congestion, and privacy are security factors that affect students stress. Security factors were 2.84 on average. Privacy is an important factor the effect of which has been investigated on stress by Barnes (2002) and Lee (2010) (8, 24). Overcrowding has been expressed as a security factor affecting stress. This factor was illustrated in Shah and Inamullah (2012) and Khan and Iqbal (2012) studies as an environmental stressor in schools, making problems for students and teachers (28, 29). Overcrowding was also described as a stressor in another review, specifically concerning children’s health. Evans et al. (1998) concluded that in the case of children, crowding is associated with stress, poor educational outcomes, and behavioral problems at schools (36). Environmental interventions such as sound pollution, light, classroom cleanliness, ventilation, and visual contamination are another group of environmental stressors that was the most effective factor among others by an average of 3.61. Previous research by Bluyssen (2014), Walinder et al. (2007), and Frackiewicz et al. (2015) has shown that sound pollution and noise play a role in increasing student’s stress, which is in line with this research results (17, 18, 21). However, this result was not in line with those of Haines et al. (2001) (37) research that expressed chronic aircraft noise exposure was associated with impaired reading comprehension and high levels of noise annoyance but not with mental health problems in students. Mental health was examined by salivary cortisol test. There is a recommendation that the mean noise level inside a classroom should be between 35 and 45 dB (38). Moreover, light is another environmental intervention stressor. This finding is in line with Mathalamuthu et al. (2014) and Newman and Rebman (2016) research (10, 11). A combination of artificial and natural light can be useful for classroom lighting (39). As a limitation of this research, some students might have over- or under-reported their stress and stressful factors. It is also possible that individuals who indicated no stress had different or lower expectations than those who experienced stress. Finally, to continue the research, it is recommended the mentioned factors as environmental stressors are studied in an experimental method and using the hormone stress test to evaluate the effect of each of them separately. In this study, stressors in the educational environment were extracted from sources, studies, and opinions of experts in the field of environmental psychology. The factors were divided into 4 groups including thermal comfort factors (air temperature, humidity, wind speed, student’s clothes, and physical activity), physical factors (space geometry, building age, space color, green space, and space materials), security (space readability, privacy, space standards, crowd congestion, and privacy), and environmental interventions (sound pollution, light, classroom cleanliness, ventilation, and visual contamination). Then, using the extracted factors, a questionnaire was designed to measure the students’ stress levels relative to different factors. Based on the results, the four groups of factors, along with their micro-factors, affect students’ stress in the educational environment. In addition, the factors can be mentioned from the most to the least importance: environmental interveners, thermal comfort, physical factors, and security. These findings can provide guidance to parents, teachers, school administrators, architects, landscape architects, planners, and policymakers interested in creating healthier environments for learning. This article is extracted from the Ph.D. Thesis entitled "Codification a Model about Effects of Thermal Comfort on Behavioral Reaction of Female High School Students." Authors’ Contribution: That is written by the first author under the supervision of the second author and the advisory of the third and fourth authors. 1. Fink G. Stress, Definitions, Mechanisms, and Effects Outlined: Lessons from Anxiety. Elsevier; 2016. 2. Gatersleben B, Griffin I. Environmental stress handbook of environmental psychology and quality of life research. Springer; 2017. doi: 10.1007/978-3-319-31416-7_25. 3. Washington TD. Psychological stress and anxiety in middle to late childhood and early adolescence: manifestations and management. J Pediatr Nurs. 2009;24(4):302-13. doi: 10.1016/j.pedn.2008.04.011. [PubMed: 19632507]. 4. Shokri O, Moradi A, Daneshpour Z, Tarkhan R. The role of gender diferences in coping styles and mental health. Cont Psyol. 2008;3(1):51-61. 5. Aminolroayaee-yamini E, Adib E. Stress Symptoms Among Students In An Elementary School In Kashan, Iran. 2015. 6. Evans GW, Cohen SA. Environmental stress. In: Stokols D, Altman I, editors. Handbook of environmental psychology. New York: Wiley; 1987. 7. Campbell JM. Ambient Stressors. Environ Behav. 2016;15(3):355-80. doi: 10.1177/0013916583153005. 8. Lee YS. Office layout affecting privacy, interaction, and acoustic quality in LEED-certified buildings. Building Environ. 2010;45(7):1594-600. doi: 10.1016/j.buildenv.2010.01.007. 9. Malinin LH. Rethinking Educational Spaces in School Design. Springer; 2017. doi: 10.1007/978-3-319-38999-8_6. 10. Mathalamuthu AD, Ibrahim NLN. Evaluation of daylighting at public school classrooms in Ipoh, Perak. Int J Sustain Trop Design Res Pract. 2014;7(1):27-34. 11. Newman WP, Rebman J. The effects of increased color rendering index on stress and depression. Electrical, Electronics, and Optimization Techniques (ICEEOT); 2016. doi: 10.1109/iceeot.2016.7754739. 12. Osman M, Ghaffarzadeh M, Sirous Z, Khatibi M, Azami A. Analyses of Daylighting Effects on Human Health in Buildings. J Solar Energy Res. 2017;2(1):54-9. 13. Shepley MM, Watson A, Pitts F, Garrity A, Spelman E, Fronsman A, et al. Mental and behavioral health settings: Importance & effectiveness of environmental qualities & features as perceived by staff. J Environ Psychol. 2017;50:37-50. doi: 10.1016/j.jenvp.2017.01.005. 14. Winterbottom M, Wilkins A. Lighting and discomfort in the classroom. J Environ Psychol. 2009;29(1):63-75. doi: 10.1016/j.jenvp.2008.11.007. 15. Al-Ayash A, Kane RT, Smith D, Green-Armytage P. The influence of color on student emotion, heart rate, and performance in learning environments. Color Res Applicat. 2016;41(2):196-205. doi: 10.1002/col.21949. 16. Jalil NA, Yunus RM, Said NS. Environmental Colour Impact upon Human Behaviour: A Review. Proc Soc Behav Sci. 2012;35:54-62. doi: 10.1016/j.sbspro.2012.02.062. 17. Bluyssen PM. What do we need to be able to (re)design healthy and comfortable indoor environments?. Intel Buildings I. 2013;6(2):69-92. doi: 10.1080/17508975.2013.866068. 18. Frackiewicz M, Kim K, Sandhu A, Uy E. The relationship between noise and privacy in UBC students' study spaces and reported stress levels. UBC Social Ecological Economic Development Studies (SEEDS) Student Report. Columbia; 2015. 19. Khayer M, Seyf D. Study of the relationship between coping with stress skills and academic achievement of undergraduate students in relation to some demographic factors. 2004. 20. Park G, Evans GW. Environmental stressors, urban design and planning: implications for human behaviour and health. J Urban Design. 2016;21(4):453-70. doi: 10.1080/13574809.2016.1194189. 21. Walinder R, Gunnarsson K, Runeson R, Smedje G. Physiological and psychological stress reactions in relation to classroom noise. Scandinavia J Work Environ Health. 2007;33(4):260-6. doi: 10.5271/sjweh.1141. 22. Oleson KW, Monaghan A, Wilhelmi O, Barlage M, Brunsell N, Feddema J, et al. Interactions between urbanization, heat stress, and climate change. Climatic Change. 2013;129(3-4):525-41. doi: 10.1007/s10584-013-0936-8. 23. Ramin M, Golbabaei F, Kakaei H, Ghasemi R. Review of Occupational Heat Stress over the Past 50 Years in Iran. Int J Occup Hygiene. 2017;8(3):179-85. 24. Barnes S.The Design In Caring Environments Study Group. The design of caring environments and the quality of life of older people. Ageing and Society. 2002;22(6):775-89. doi: 10.1017/s0144686x02008899. 25. Evans GW, Wener RE. Crowding and personal space invasion on the train: Please don’t make me sit in the middle. J Environ Psychol. 2007;27(1):90-4. doi: 10.1016/j.jenvp.2006.10.002. 26. Kopec DA. Environmental psychology for design. New York: Fairchild; 2006. 27. McGeehan P. For train riders, middle seat isn’t the center of attention. The New York Times; 2005. 28. Khan P, Iqbal M. Overcrowded classroom: A serious problem for teachers. Univ Sci Inf Technol. 2012;49:10162-5. 29. Shah J, Inamullah M. The impact of overcrowded classroom on the academic performance of the students at secondary level. Int J Res Commerce Econ Manag. 2012;2(6):9-11. 30. Berto R. The role of nature in coping with psycho-physiological stress: a literature review on restorativeness. Behav Sci (Basel). 2014;4(4):394-409. doi: 10.3390/bs4040394. [PubMed: 25431444]. 31. Li D, Sullivan WC. Impact of views to school landscapes on recovery from stress and mental fatigue. Landscape Urban Plan. 2016;148:149-58. doi: 10.1016/j.landurbplan.2015.12.015. 32. Epstein Y, Moran DS. Thermal comfort and the heat stress indices. Ind Health. 2006;44(3):388-98. [PubMed: 16922182]. 33. Fanger PO. Thermal comfort. Analysis and applications in environmental engineering. Thermal comfort. Analysis and applications in environmental engineering. 1970. 34. Ekkel ED, de Vries S. Nearby green space and human health: Evaluating accessibility metrics. Landscape Urban Plan. 2017;157:214-20. doi: 10.1016/j.landurbplan.2016.06.008. 35. Arnberger A, Eder R. Are urban visitors’ general preferences for green-spaces similar to their preferences when seeking stress relief?. Urban Forest Urban Green. 2015;14(4):872-82. doi: 10.1016/j.ufug.2015.07.005. 36. Evans GW, Lepore SJ, Shejwal BR, Palsane MN. Chronic residential crowding and children's well-being: an ecological perspective. Child Dev. 1998;69(6):1514-23. [PubMed: 9914637]. 37. Haines MM, Stansfeld SA, Job RF, Berglund B, Head J. Chronic aircraft noise exposure, stress responses, mental health and cognitive performance in school children. Psychol Med. 2001;31(2):265-77. [PubMed: 11232914]. 38. Dreossi RCF, Momensohn-Santos T. O ruído e sua interferência sobre estudantes em uma sala de aula: revisão de literatura. Pro-Fono Revista de Atualizacao Cientifica. 2005;17(2):251-8. doi: 10.1590/s0104-56872005000200014. 39. Wessolowski N, Koenig H, Schulte-Markwort M, Barkmann C. The effect of variable light on the fidgetiness and social behavior of pupils in school. J Environ Psychol. 2014;39:101-8. doi: 10.1016/j.jenvp.2014.05.001.